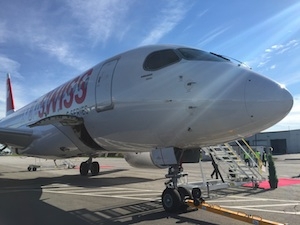 Bombardier Aerospace in Toronto was a hub of activity today as the new CS100 was showcased in front of a select group of media, municipal, provincial and federal politicians and more dignitaries. It was also a special day for the hardworking aerospace employees at Bombardier, who had the opportunity to check out the aircraft for the very first time. Bombardier took the opportunity to also announce the aircraft has successfully completed all noise performance testing and preliminary data confirms it is the quietest in-production jet in its class. This should bode well for companies such as Porter Airlines, which is hoping to utilize the C Series 100 from Toronto’s Billy Bishop Airport. Rob Dewar, vice president of the C Series Aircraft program, Bombardier Commercial Aircraft, gave a thorough presentation on program and performance targets, and shared that the aircraft is meeting or exceeding almost all development requirements. Now almost 85, per cent complete, the C Series is on track in all stages of development, he said. One Bombardier employee who is particularly excited about the program is Mark Elloit, the chief liason pilot, BFTC Flight Test Ops in Montreal. Elliot called the aircraft unique in its handling and flight capacities, and he was enthused about the cockpit layout and functionality.